We are very excited to announce the release of Wise Driver Care beta! Download and update outdated Windows devices drivers! Wise Driver Care can automatically scan, download and update drivers. Easily fix missing, outdated or faulty driver errors. Keep your computer in top condition! 2, Reduce system freezing and crashing. 3, Wise Driver Care only recommend WHQL drivers. 4, One-stop Windows driver management. Click here for direct download Wise Driver Care beta. However, there is still space for improvement for this beta version, please leave a comment or write down the bugs you found below. We would really appreciate that. The official version is released. Easy to understand, fast and clear, clean layout. I've found a spelling mistake. 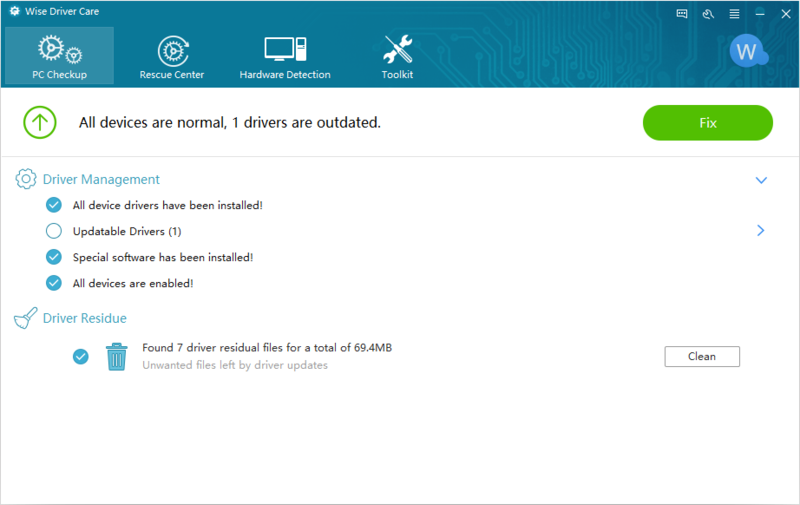 A driver update was found for "HP Computer TohchPad Driver." Of course, that should be "TouchPad"
Another issue that I've found, is that after installing driver updates, the status is not updated to show that the drivers have been been installed - it still shows there are driver issues. I used the cleaning function for drivers and afterwards my touchpad stopped working. Will it be free in the future? I'll put in green color my concerns and the concerns of other possible users I saw in the past. - Abnormal Drivers What's this? - Special Software What's this? - All device drivers have been installed! What do you have installed without my consent? - Special software has been installed! What's this? What do you have installed without my consent? - All devices are enabled! I'd suggest instead: "All devices are enabled and supported by the right drivers!" Found 34 driver residual files for a total of 520.8...Here the text is cut, maybe because I'm using 150% custom scale. The tooltip/hint doesn't appear, showing me what's there after the dots. Unwanted files left by driver updates. Then there's a clean button. I still don't know if those 520.8 are bytes, kilobytes, megabytes or gigabytes, and I won't click that button until I know what I'm deleting. Therefore the suggestion here is to provide a "see the files" or "details" button. The support center is present in two places (at top and in toolkit): isn't it redundant? I'd change the default driver backup folder to something like %UserProfile%\documents\WiseDriverCare Backups. The storage location in the rescue center under the backup button isn't visible (the tooltip/hint works, at least): consider to increase its width. The WiseDriverCareHdReport.txt (hardware detection - export hardware info) should be put in the desktop. It could have been generated inside WiseDriverCare folder, if it were a portable application. Somewhere in the program (and in the website) a sentence should state where the drivers will be collected from. Can you give me a screenshot of it? I didn' find it in language file. Did you try to restart system? When we release the official version, some features wil be locked. But, you can download driver update for free. 1, Abnormal Drivers What's this? It refers a driver issue which can be solved by reinstall / update driver. 2, Special Software What's this? Special software, it refers a driver/software for some special function which Windows system does not offered, you need to install it manually. E.g., touchpad, fingerprint. 3, All device drivers have been installed! What do you have installed without my consent? Wise Driver Care only check up whether all devices have installed drivers. 4, Special software has been installed! What's this? What do you have installed without my consent? Like 3, wise driver care only check up, won't install anything without your action. 5, All devices are enabled! I'd suggest instead: "All devices are enabled and supported by the right drivers. No, it only checks up the device is enabled or disabled. 6, Found 34 driver residual files for a total of 520.8...Here the text is cut, maybe because I'm using 150% custom scale. We will fix it sooner. 7, The storage location in the rescue center under the backup button isn't visible. Did you click the greed words "Modify"? 8, The WiseDriverCareHdReport.txt (hardware detection - export hardware info) should be put in the desktop. Good idea, we will fix it soon. 10, Language issue, we will fix it soon. Several times with no change, had to reinstall the T-P.
Are you interested in a translation to Swedish for a free license of the paid version? WiseCleaner team usually offers a (one year?) license key to the official translator of one of their programs. Read Help Us Translate and Get A License Key (click). Nonetheless, wait for an official answer by WiseCleaner_admin. I'm sure people think I'm a plant, as I posted first, but I really didn't have any problems with it. Interesting to see what others have experienced. Trying to add a Intel custom graphics driver to ignore list but seems not to work.Windows 10 64bit version 1607 on Toshiba Satelite P55W is my setup. Upgraded to newer version .620 over .613 and seems to have fixed ignore problem,although still showing older version.I also have been using support through program.They keep telling me there is a message but there is none. Latest version 621 seems have corrected the incorrect version shown problem.Don't know if message problem has also been fixed. I'm not sure, please help us to check it. I'm localizing in French Driver Care (as all the other Wise products ) beta version 1.0.621. Such job generates many restarts of the program "under translation" (to validate step by step the "well fit" of the French into the program GUI). I noticed that suddenly that, if Driver Care processes are starting on the launch icon click, the Driver Care main windows did no appears on the PC screen. I mean that wisedrivercare.exe and wdcservice.exe are active in the Windows Tasks Manager processes list but looks like being in background only (so useless because not accessible ). This occurs randomly after a couple of close/restart !! Not sure how to help explain? Also reliability monitor is triggering every time I open program.Stability problem maybe? Another bug I've found is that the driver "Intel Graphics Driver" 8.15.10.1930 (display is shown as Mobile 945 Express Chipset Family in Device Manager) fails to download. roger_m if your computer uses a custom graphics driver installed by the manufacturer driver update software will not install a generic driver because it will cause issues. My computer does not use custom drivers. In any case the issue with Wise Driver Care is unable to download the driver update it finds. Can you tell me your location or your IP address? Australia. It is the only driver which fails to download. I've had no issues downloading any other drivers on a number of computers.